The Woodson House was designed for Leigh Yawkey and Aytchmonde P. Woodson by George W. Maher. Leigh was the only child of Cyrus and Alice Yawkey. After the Woodsons were married in 1911, they lived in Kansas City where Mr. Woodson practiced law. When the Woodsons decided to return to Wausau, the Yawkeys hired George W. Maher, the Prairie School architect to design a house. 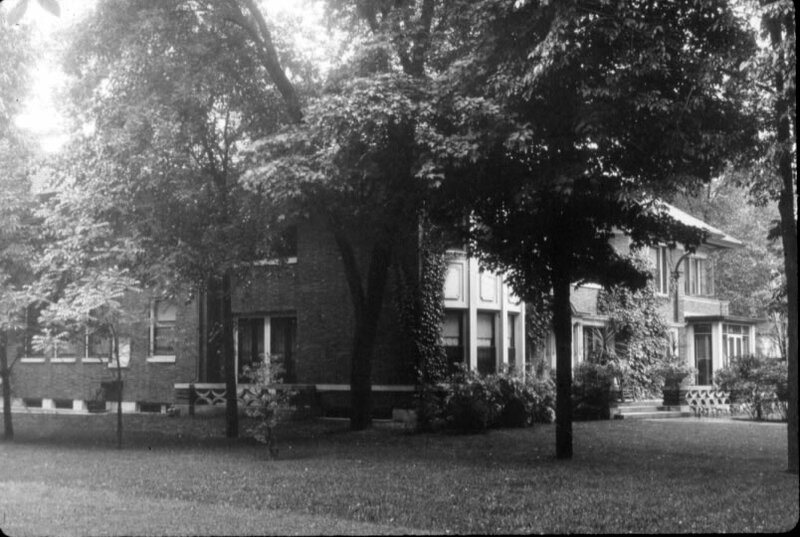 They wanted the Woodsons to be close at hand, so the Yawkeys bought the Sexsmith house across the street and had it moved, enabling the Woodson House to be built on this site in 1914. The house was the last Prairie School style house designed by Maher in Wausau. He had designed three large stucco Prairie houses in Wausau. Only two are extant. He also designed two Colonial Revival houses and the public library (now demolished). The design that Mr. Maher used for the Woodson house was the dominant horizontal line, but the hipped roof was divided into three sections and there were several motifs such as the arches, the lotus flower and cartouches. These motifs are repeated on the exterior as well as the interior. The large windows on the second story are typical of the Prairie School style of architecture. The series of windows in the living room are called ribbon windows. The house is brick and the roof is tile. Note the wonderful triple chimneys that mimic the three sectioned roof. According to Maher expert, Don Aucutt, the motifs are: segmental and semicircle arches, guttae in various sizes, lotus flowers, lotus buds and cartouches. They appear inside and outside. The motifs show in the dining room sideboard and table and chairs (now in the historical society library). This furniture was made at Hasselgren Studio in Chicago, a firm which between 1911-1937 furnished many large suburban Chicago houses. The entryway leads to a beautiful carved walnut stairway. All of the woodwork on the first floor was given seven coats of varnish. The wood was rubbed with pumice between coats. The Woodsons sold the house to the Immanuel Baptist Church in 1954. The church added the sanctuary in 1956. The Marathon County Historical Society purchased the property in 1995. Today it is used for the administrative offices for the Society, the research library and archives; the artifact storage and exhibits are also in the building. Renovations began in 2009 with the installation of an elevator, and repairs and updates to the exterior. Major renovations continued in 2010 on the interior. The first floor of the 1963 addition to the building featured a new handicap accessible back entrance leading to a 2,800 square foot gallery and reception area, and an updated research library. An 800 square foot second floor gallery now overlooks the first floor gallery, and includes an adjoining children's area in what was once the master bedroom of the 1914 A.P. and Leigh Yawkey Woodson house. The north exterior brick wall of the house, which was covered up by the 1963 addition, has been exposed and serves as the backdrop to the new reception area, the second floor gallery and the open staircase joining the two galleries. A large reception hall and handicap accessible restrooms are now available in the lower level. All three levels are easily accessed by the elevator or the open staircase. Updates and restoration have also take place in the 1914 historic Woodson house. The dining room was restored so that it can be used as a large meeting room featuring the original Woodson family dining room table and buffet. The living room, previously the research library, has become a comfortable sitting area where visitors can leisurely browse through many photos, documents and displays while relaxing in a wonderful historic setting. The restored dining room and living room will serve as a reception area for historical society events and will be available for rent by outside groups. Click here for rental information. Along with all of the improvements to the public spaces, our archives and collection storage areas have been updated with appropriate climate control to ensure their safety well into the future. Click the slide show link above to view the progress of our project.